Sir Martin Sorrell has unveiled S4 Capital's stock market prospectus and claimed the content production business will win clients by cutting out ad agencies. S4 Capital’s prospectus confirmed it acquired Dutch content firm MediaMonks for $348 million (€300m or £266m) in July and is set to begin trading on the London stock market after a shareholder vote on September 27. The front cover of the prospectus (pictured, left) features an image of a Burning Man sculpture to signify regeneration and says the group’s ambition is: "To create a new era, new media solution, embracing data, content and technology, in an always-on environment for multi-national, regional and local clients and for millennial-driven digital brands." S4 Capital will provide digital marketing services that "are agile, efficient, and of premium creative quality, in other words faster, better and cheaper" and it will have one P&L, rather than having "multiple" profit centers. The 189-page document spells out in detail for the first time the market opportunity that Sorrell sees for S4 Capital, which he set up just six weeks after abruptly quitting WPP in April after 32 years as chief executive. "Brands are increasingly engaging directly with digital media companies such as MediaMonks (rather than through advertising agencies)," the prospectus says, describing it as an "opportunity" for S4 Capital "to build stronger relations with clients" and to increase gross profit. "A number of organizations that have traditionally been regarded as consultancy businesses with an emphasis on technological services in the digital marketing arena have begun to acquire creative operations and are therefore moving more directly to compete with combined operators such as MediaMonks," S4 Capital adds, citing "IBM, Accenture, Deloitte and PwC" as competitors. 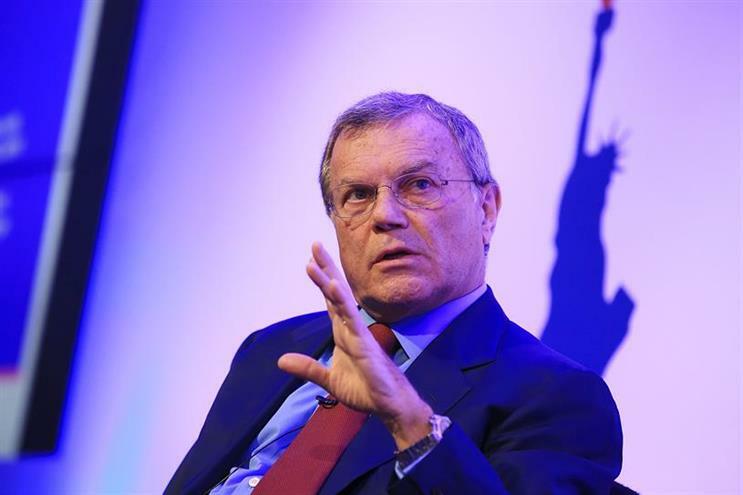 The comments are striking because when Sorrell was running WPP, the world’s biggest ad agency group, he played down the threats from brands by-passing agencies and management consultants entering marketing services. S4 Capital is set to join the London stock market through a reverse takeover of an existing shell company, Derriston Capital, echoing how Sorrell launched WPP in 1985 by "reversing" into Wire & Plastic Products. Shareholders in Derriston Capital must vote to approve the takeover on September 27, before S4 Capital’s shares are expected to begin trading a day later. 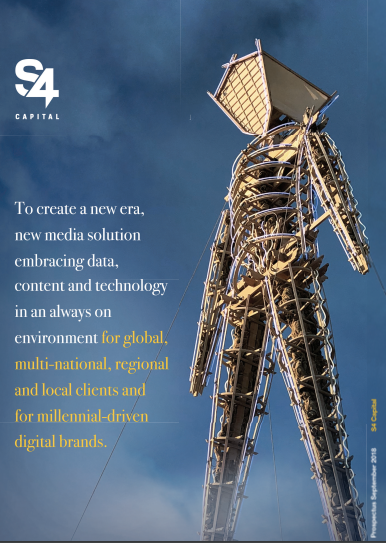 S4 Capital plans further acquisitions in content, data analytics, media planning and digital media buying. The prospectus contains financial details about MediaMonks and warnings about risks to the S4 Capital business. MediaMonks doubled its revenues from $42 million (€36.2m) in 2015 to $87.9 million (€75.7m) in 2017 and profits before exceptional items (EBITDA) increased from $5.6 million (€4.8m) to $9.6 million (€8.3m). Revenues jumped 50% to $62.7 million (€54m) in the six months of 2018 compared to 2017 and EBITDA trebled to $12.9 million (€11.1m). MediaMonks’ management are in line for a €25m bonus after four years if they can grow the business. The two most senior figures, Victor Knaap and Welsey ter Haar, each got $3.5 million (€3m) on completion of the deal with S4 Capital and will get another $3.5 million (€3m) each in a year’s time. Sorrell and senior management will be entitled to 15% of the growth in S4 Capital’s value, if the company hits an annual compound growth rate of 6% over five years by 2023. Sorrell will earn a base salary of just $130,300 (£100,000) a year, plus potential $130,300 (£100,000) annual bonus, and have a 12-month clause in his contract restricting him from working for a competitor – in contrast to his time at WPP. Sorrell will own 18% of S4 Capital’s shares but will have controlling power through a voting share. Knaap and ter Haar own about 13.7% between them through their personal investment company. Other top shareholders are financial institutions, including Tosca Fund Management with 13.3%, Canaccord Genuity Wealth Management with 9.5% and Rathbones and Lansdowne Partners with 3.9% each. The prospectus warns that Sorrell’s voting power is a potential risk. "Should the interests of Sir Martin and the company and/or the other shareowners come into conflict, the company would be deadlocked and unable to take any action to further its operations and strategy," it says. Sorrell left WPP after an investigation into allegations of personal misconduct, which he strenuously denied, and the UK’s stock market authorities "required" S4 Capital to give details about the circumstances of his exit. WPP looked into "an anonymous allegation that Sir Martin had used petty cash to pay for expenses incurred other than in connection with his duties as CEO of WPP" but "no written report was ever prepared" by external lawyers or WPP. Sorrell was treated as "a good leaver" and he agreed a settlement that means "there is no further action that WPP can pursue against Sir Martin in relation to the allegation that he misused WPP funds", according to the prospectus. However, WPP has subsequently claimed Sorrell may have breached the terms of his old employment contract by buying MediaMonks. He denies wrongdoing and has given S4 Capital a six-year legal indemnity, protecting the company from any potential legal action by WPP.